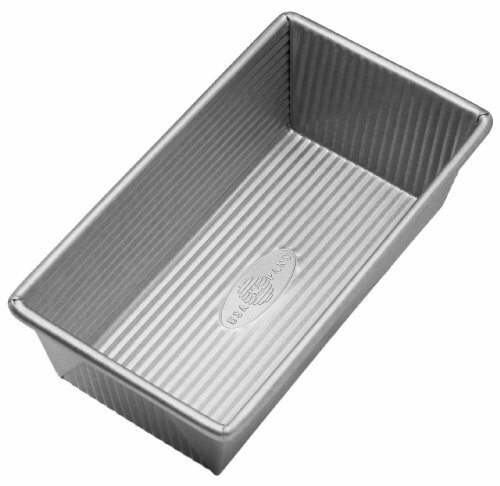 The USA Pan 1 pound Loaf Pan measures a full 8.5 x 4.5 x 2.75 inches* and provides home bakers with an easy way to bake the perfect quick bread, flawless pound cake, super moist cornbread, or classic meatloaf. Bake top quality artisan breads that come out finished with beautifully flaky crust. An extremely versatile kitchen accessory, the USA Pan’s 1 pound Loaf Pan can also be used for everything from no-crust quiches, to delicious chicken pot pies. With a patented AMERICOAT Plus non-stick coating, the USA Pan 1 pound Loaf Pan allows for easy clean-up and truly effortless release of your baked items. AMERICOAT Plus is also PTFE, PFOA, and BPA free. Every USA Pan is made in the USA and has been designed with the same standard high performance features that commercial bakers enjoy including aluminized steel and heavy gauge steel construction that allows for even heat distribution and maximum service life. The USA Pan 1 Pound Loaf Pan also features a steel wire in the rim, which provides extra strength and further provides resistance to warping. The USA Pan 1 pound Loaf Pan's unique fluted surface design facilitates air circulation and also maximizes pan strength, which helps to resist warping. USA Pan’s professional grade bakeware helps everyday home bakers produce professional grade baked goods. USA Pan bakeware is long-lasting, durable, reliable, and comes with a limited lifetime warranty. USA Pan is a Bundy Family owned company, based in the Greater Pittsburgh, Pennsylvania area that has been producing high performance bakeware for over 50 years. *Dimensions represent baking surface, not overall pan size.